Probably unique in this area, I built my Skerry from plans bought from Fyne Boats over 18 months ago. It didn't take me 18 months to build it though; I started in February and launched her in early July. There were no real dramas in building from plans but I'm sure it would have been easier with a workshop! Most of the work was done outside my house, weather permitting, my hallway was the epoxy coating shed and my downstairs balcony my woodworking shop. Towards the end I was restricted to working early mornings and evenings. With temperatures climbing towards mid 30s °C epoxying and painting was difficult and impossible during the day. But I got her ready for the water in time for my family's holiday - they arrive this coming Wednesday (23rd July). This winter I'll bring her back up to the house, rub a lot of it down and really finish her off. 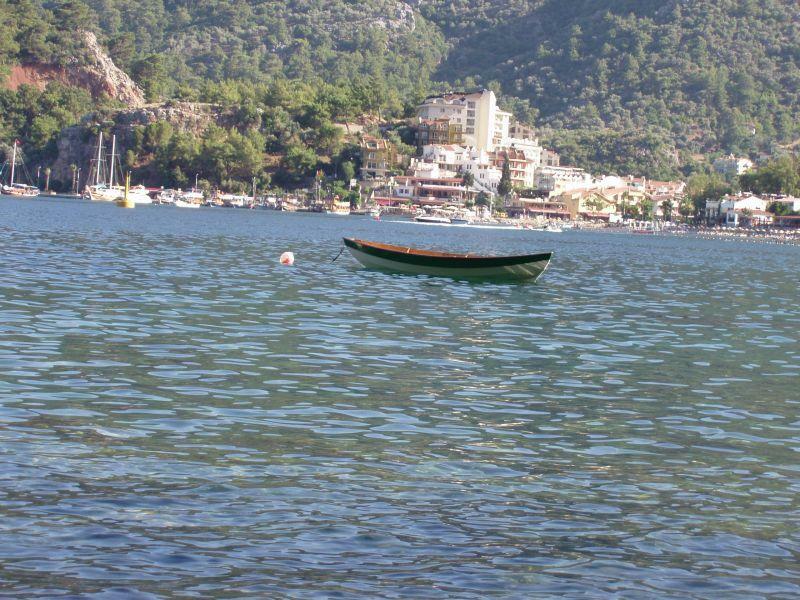 and here she is on her mooring in the north corner of Turunç, a few kilometres south of Marmaris. I have my sprit sail now so I guess it's time to go and learn how to sail a dinghy again although I originally chose the Skerry as a good rowing boat. I'm a keen rower and whilst I can't yet comment on her sailing abilities I can assure you she's a joy to row. 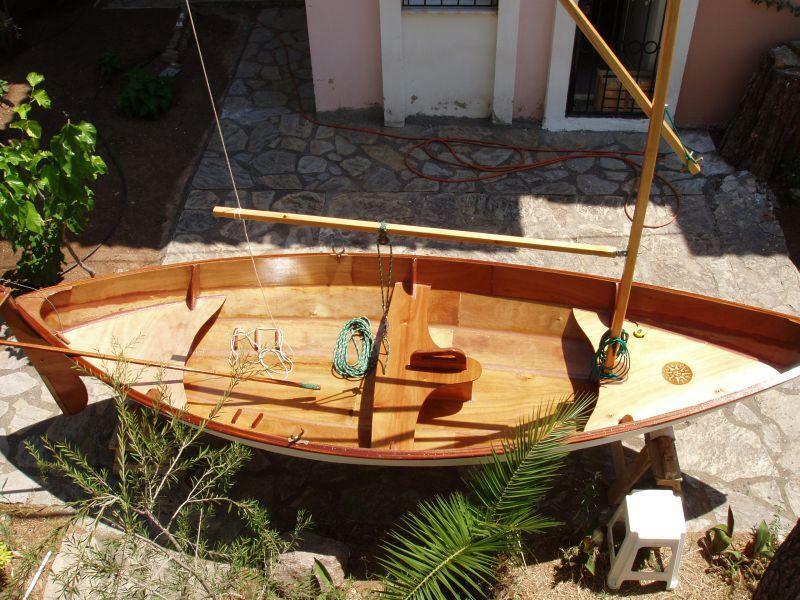 A great little pulling boat! Brilliant and what a great looking spot for a launch! My Skerry is still in dry dock, too much work to contend with this summer, but I am hoping to get her afloat in the next month! Congratulations on a successful build! Thanks Wilddog! Yeah, I live in a great place although we have a rocky, stony beach. But that's life. Your Skerry is coming along just fine from what I've seen and although you are having difficulty finding time to work on her there's no real reason to rush, is there? I'm taking my grandchildren out round to the next bay this morning for a bit of snorkeling. OK now you're just rubbing it in! No there is no reason to rush - apart from the fact that we are the best summer in the UK since year dot! Am gagging to get out on the water, so like you I have adopted similar approach, get the boat built and on the water and then refine later as required...! I plan to flip my boat over this weekend and finished the filleting on the underside of the seats and the mast partner & step. I then just have to cut the hole for the dagger boat and it is painting time...! She'll be in the water later this summer. Enjoy the snorkeling....but if I were you I'd do a few laps of the bay in the boat first!